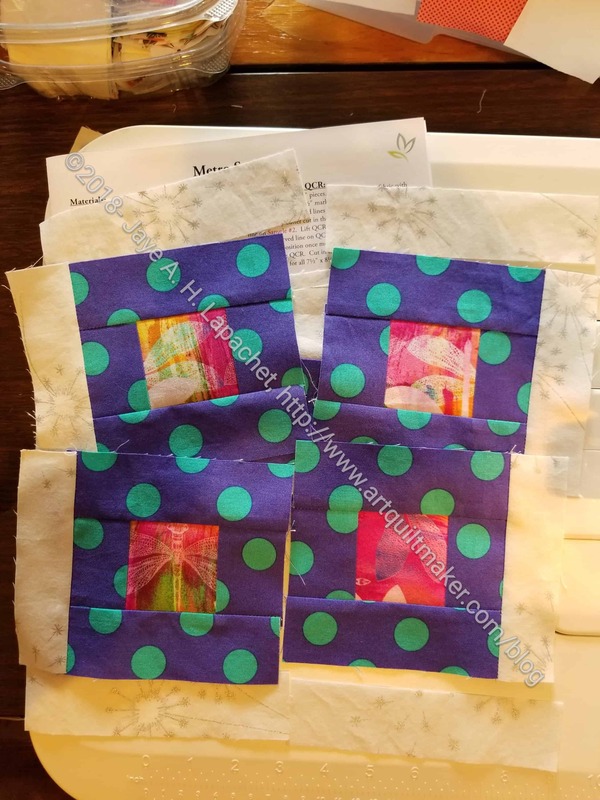 I was feeling a little discouraged by my City Sampler Progress. I felt like I spent last weekend sewing and sewing and sewing and not getting anywhere. Then, all of a sudden, the whole left side is together! That side has 36 blocks, so I am not yet halfway through, but I do feel like it is significant progress. I also don’t feel as discouraged. I have hope that I will be able to get this top together. I am thinking of putting the border on that side before sewing the side to anything else. 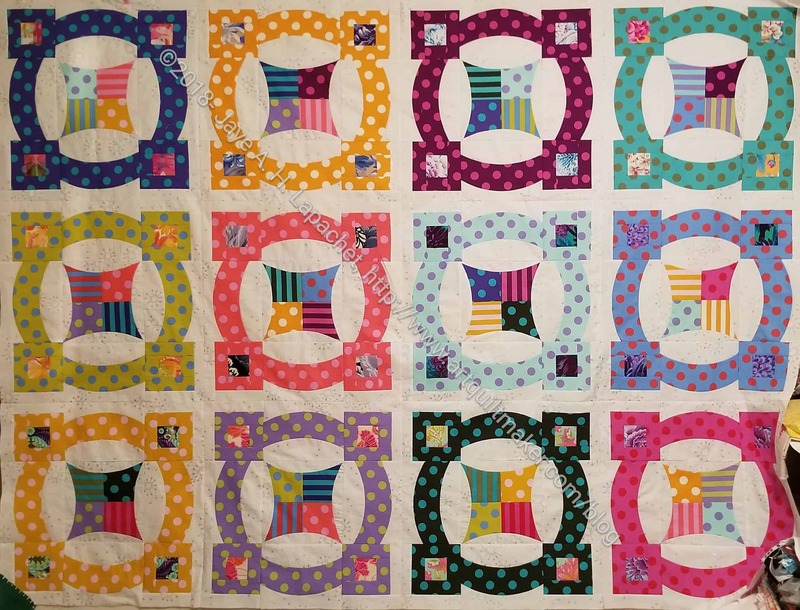 I think it will be easier than wrestling the quilt when it is finished. I took some time over the weekend to work on the City Sampler. It is slow going, but I am making progress. Because of the seam allowance issues and the fact that the blocks are tiny, it is taking me time to sew the whole thing together. I know it is not a race and I have to keep telling myself that. I am back in the City Sampler saddle. I need a big finish to up my fabric usage numbers. Getting this top done is the first step. 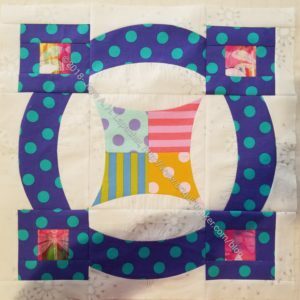 One of the things I mentioned in recent 26 Projects posts was that I had to fix some blocks. I have been working on that and now have only about 20 blocks to go. I am liking the way the top looks and am looking forward to putting it together. It’s the last one for this quilt. I will make these again, though I may need to vary my colors. 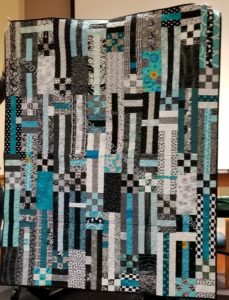 I can’t say I am sick of turquoise, but I might be in this pattern. Sewing the back is my least favorite part of the quiltmaking process. 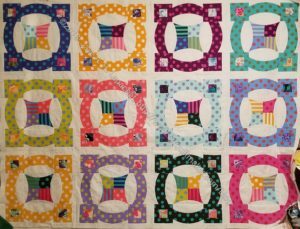 Quilting doesn’t count since I usually don’t do it. This particular back took longer than expected, because I prepared all the fabric twice. I decided to use the stripes for the back because I hadn’t used much of them on the front. I proceeded to cut up the dot fabrics for the back. Nope, not a typo. I did the exact opposite of what I intended. I don’t know what I was thinking. It didn’t really matter, so I took down all the dots and started again. 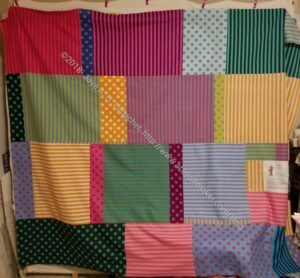 I had made the binding in advance so I could use all of the stripes I wanted as long as I could deal with the diagonal cut out of the yardage for the binding. As you can see from the photo, I was able to make a back. It seems a little darker than I intended, but it could just be the contrast of the white from the front. I stole a few minutes from a very busy weekend to sew. I need to finish the MetroScape back and binding before Thursday. 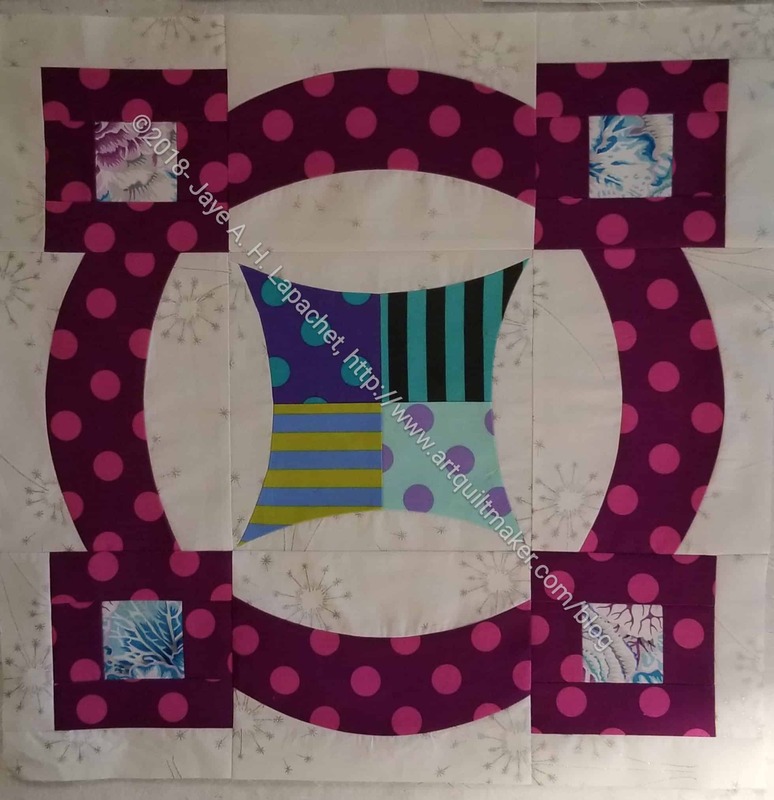 I am taking quilts to Colleen to be quilted. 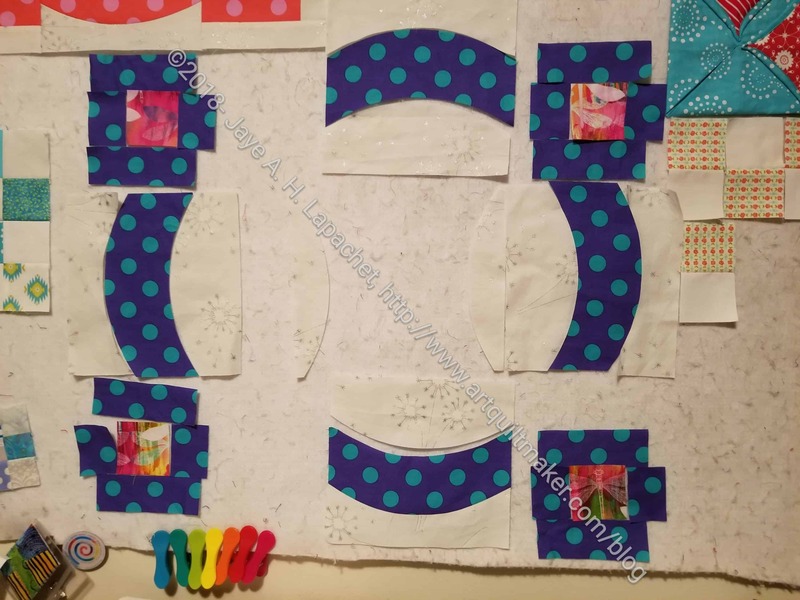 She is finally feeling better and able to quilt a bit again, so I can pick up the Stepping Stones #2 as well. 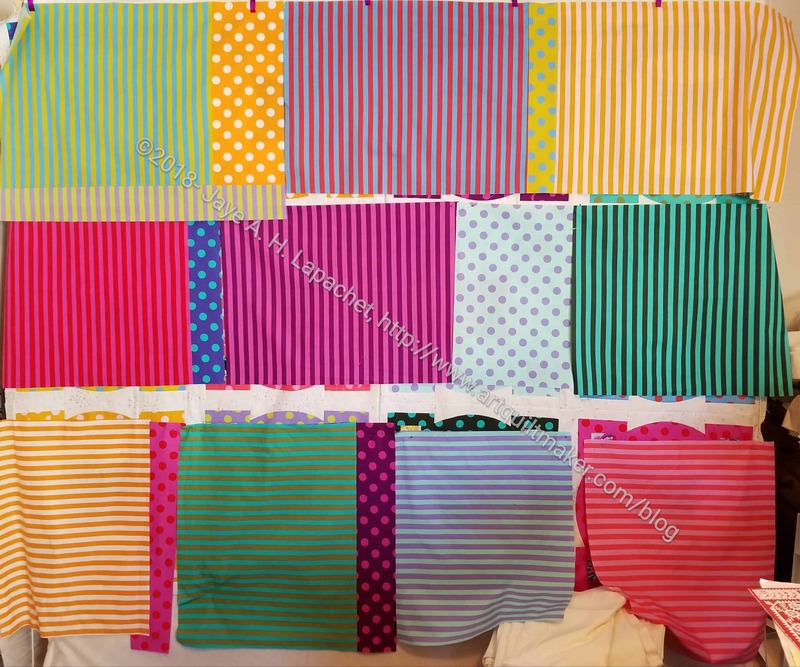 I decided, after I cut up all the dot prints, that I hadn’t used many of the stripes on the front, so I would use them on the back. I spent a lot of Saturday evening recovering the stripes from making the binding. They all of have a big diagonal strip cut off the length. The binding is finished, which is always a relief. I have enough fabric for the back. I just have to make it work. 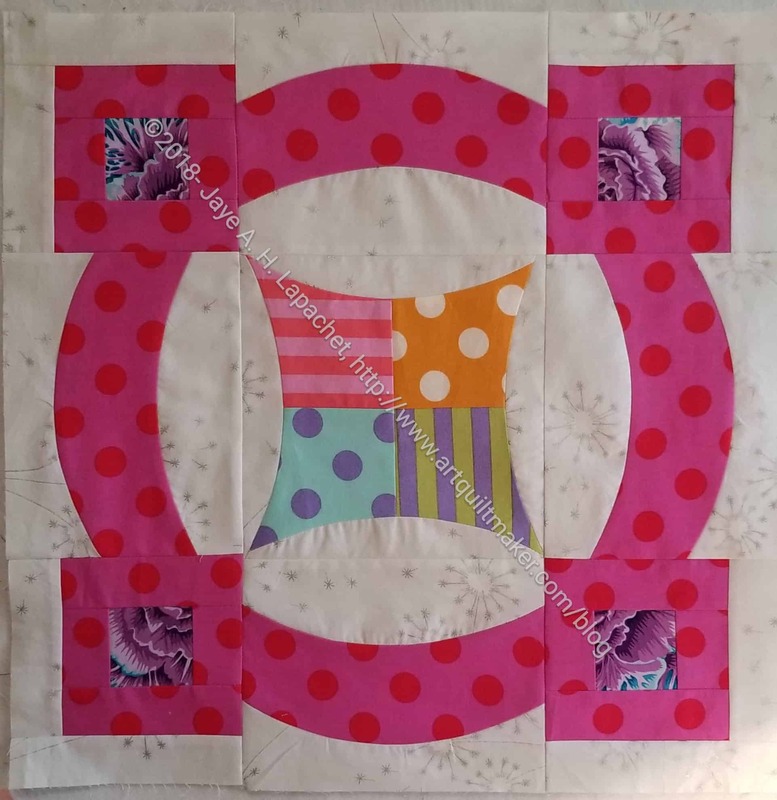 Right now my issue is what to put in between the three horizontal lines of fabric. Cyndi is a member of my local guild whose work I really like. She has a similar color sense to me. 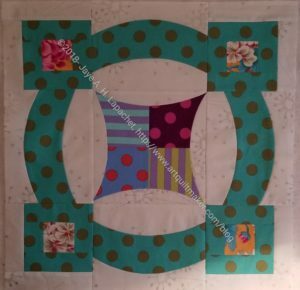 I saw her starting this quilt a few months ago and was excited by the color scheme. The finished piece turned out better than I could have imagined. It really looks like a quilt that could be used and cuddled on the couch. 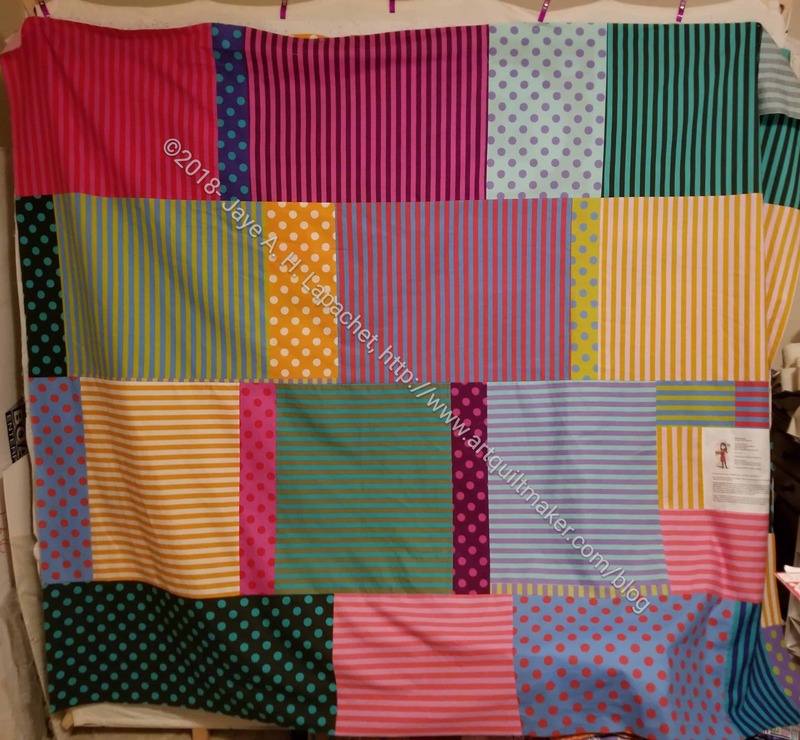 It is a pattern called ‘A’s Strips’ by Amy Cowan and Opal Cocke of Here2There Designs. 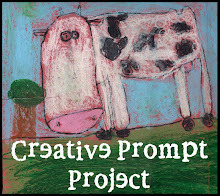 Amy also produces the Creative Mom podcast. At last year’s Retreat, we got a nice donation of top quality fabric from MassDrop. 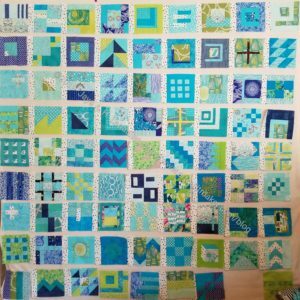 Some of the fabric was difficult to use because of the designs,but people powered through and made donation quilts. 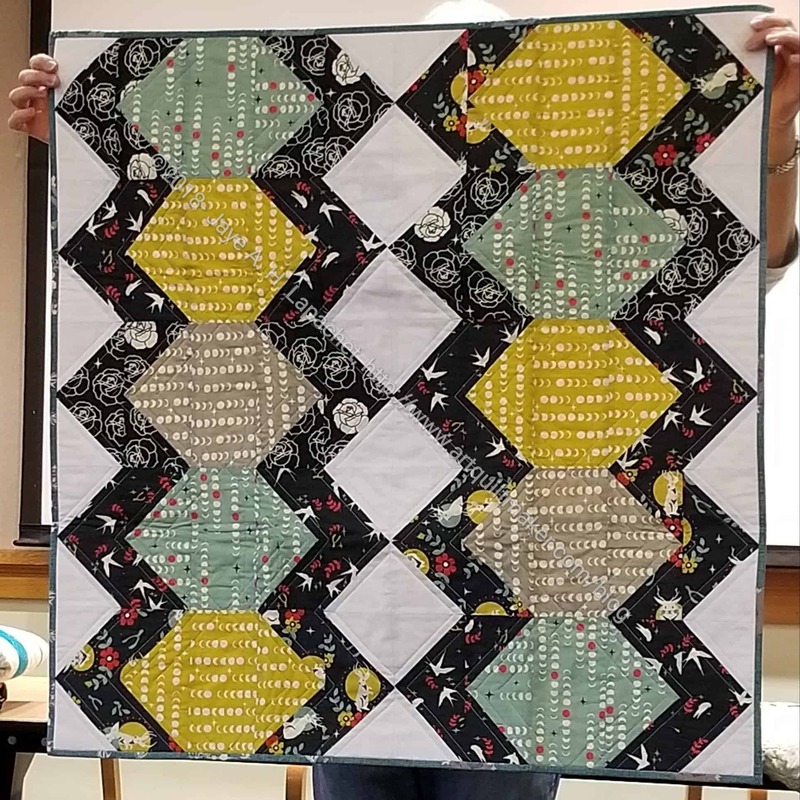 Cyndi recently finished another one using a great design. It’s really fun to see what others are making. I came home from my trip on Sunday evening. It was actually the second trip in a week, but I was only home for about 12 hours between trips and much of that was spent sleeping, so I hadn’t done any sewing for over 10 days except some EPP in the car. Monday was a holiday and DH was home. I had to do some work, but I pretended for most of the day that it was Sunday. I chatted with my mom on the phone while I ironed a ton of fabric. I also worked on some donation blocks and put the MetroScape top together. Yep. All those blocks are now a top! I am really pleased with the way it looks. I am just trying to decide about a border. I like I like it as is, but we will see. I am back from 4 trips in 4 weeks. 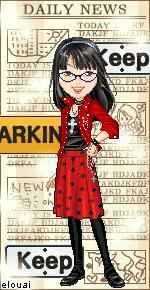 I am hoping I can can get to know my husband again, get back on schedule and get life back to normal. 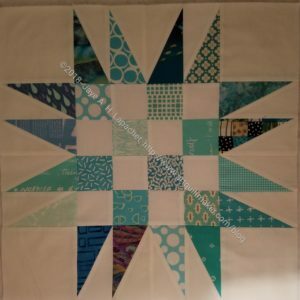 I have finished the last Metroscape block and am ready to start making a quilt top. Actually, I am ready to do a whole bunch of sewing. This block is my least favorite. The blue and red, especially the blue don’t see to go with the other blocks. I had 12 different dots and I didn’t want to repeat any, so I used it. 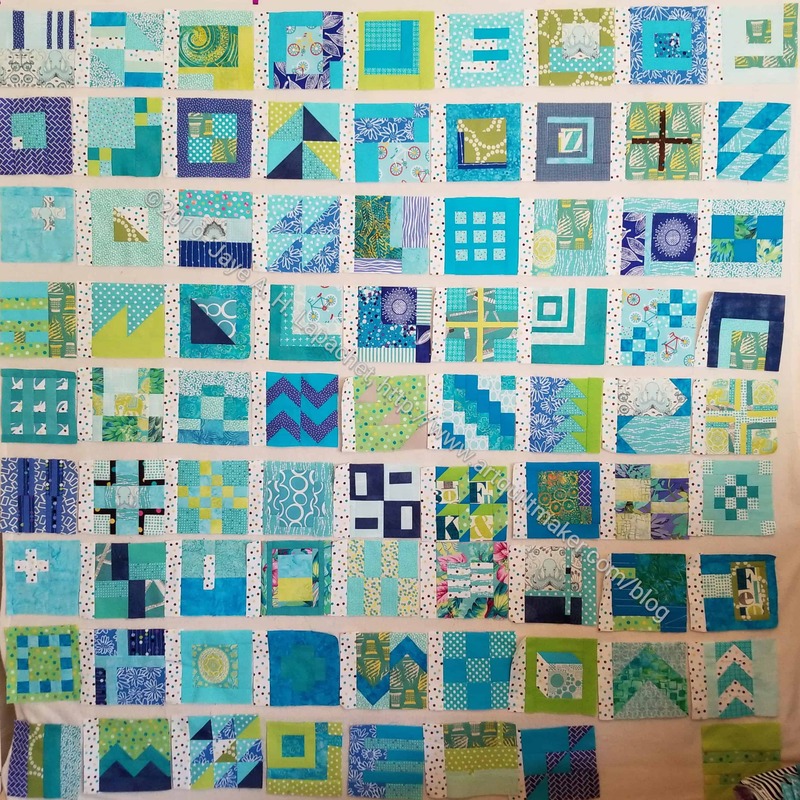 We will see how I like it when I put all the blocks on the design wall together. I finished another MetroScape block. 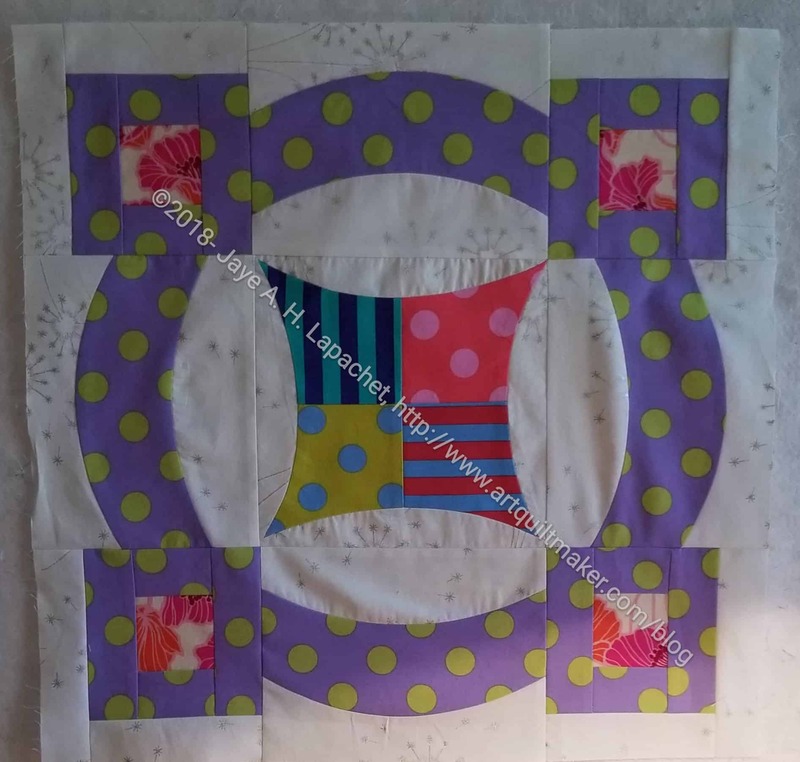 This is the second to last one and I should be able to get a start on putting the quilt together soon. I didn’t cut my regular Hunting and Gathering pieces, because I was afraid I wouldn’t have enough fabric for the blocks. I am pleased that I have plenty and will be cutting the pieces I need for various other projects soon. I finished another MetroScape block the other day. 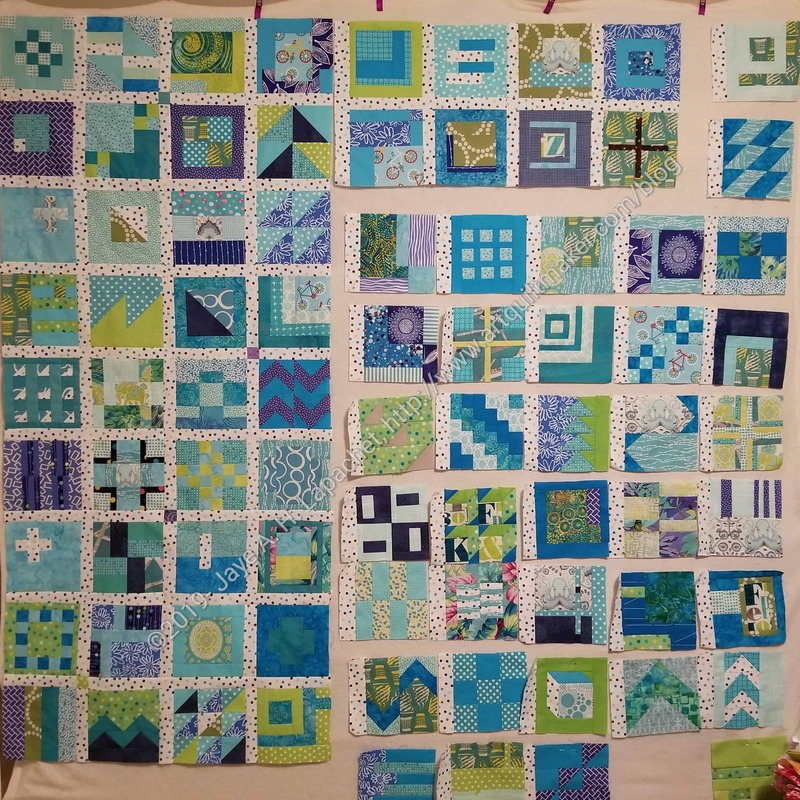 I am closing in on finishing the blocks and think I am ready to put the quilt together and be done with it. I am still pleased with the way these pieces are coming out. I am just ready to move on Who Am I? is on my big design wall and it is starting to call to me again. I finished another block over the weekend. I like the foreground fabric. That light green (sage or light aqua??) is really nice and unusual. I have 8 of these now and cut the rest of the foregrounds, so I could spread out the colors. I have enough of the dots so that each foreground will be unique unless I decide to make extra blocks. 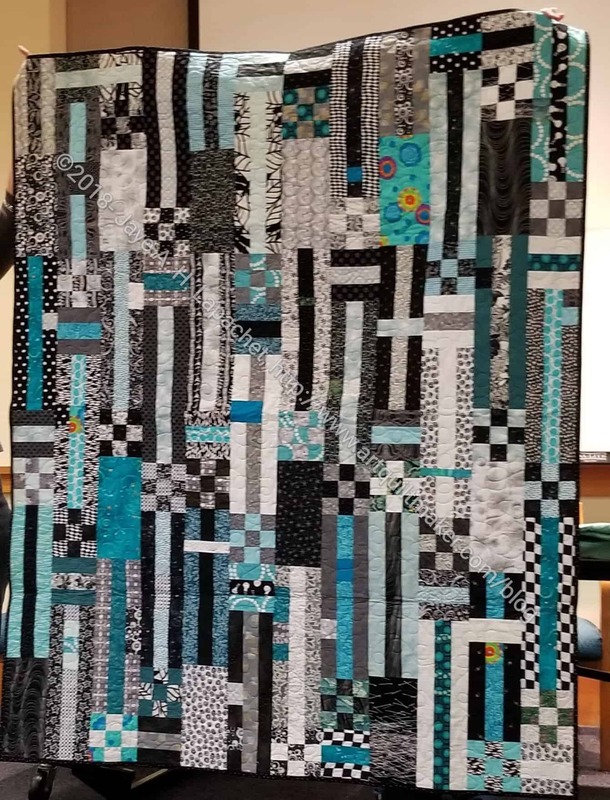 We’ll see how large I want this quilt to be. As mentioned, I spent a lot of time Saturday afternoon and evening working on the Ends n.6 donation top and back. Before I got to work on that project. 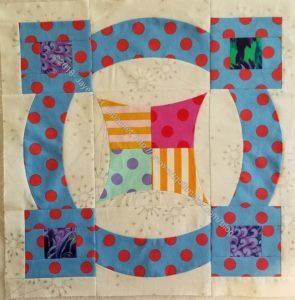 I finished the MetroScape block n.5. I had done most of the work last week, but hadn’t quite has the time to finish. I am pleased with the way it came out and am liking the look of the Quick Curve Ruler pieces more and more. 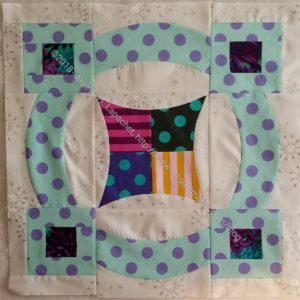 While at PIQF, we talked to the Elkhorn Quilt Company lady about the mini Quick Curve Ruler. 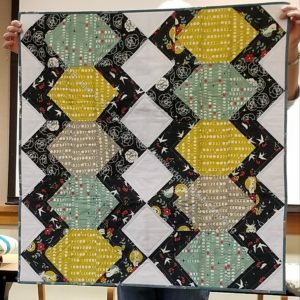 Apparently, Sew Kind of Wonderful has come out with a new book using the the mini Quick Curve Ruler with a lot of new designs. 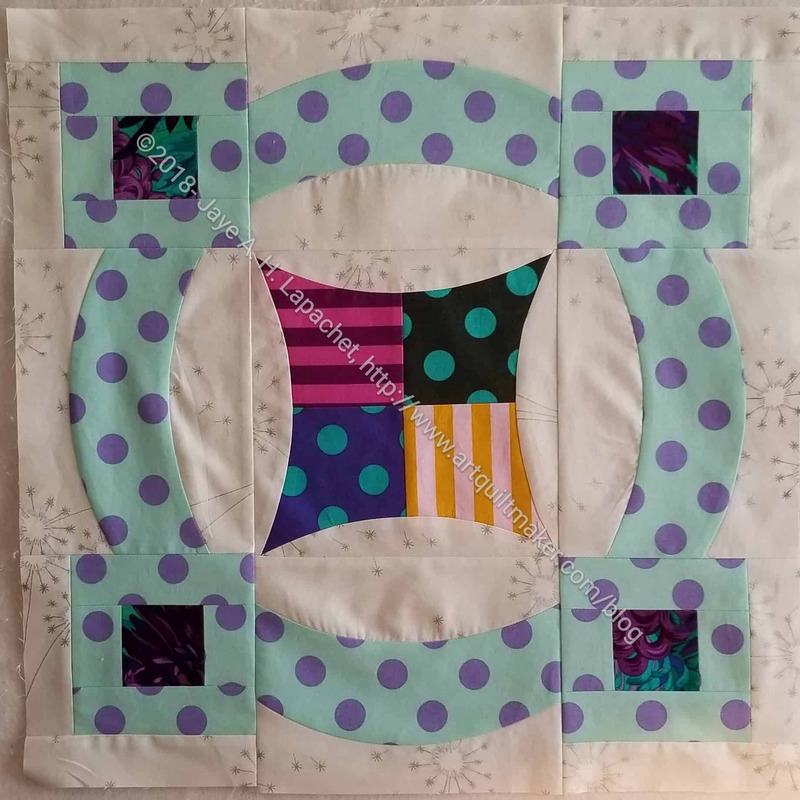 Julie was attracted to a pumpkin wall quilt pattern, so she bought the pattern and the ruler. FYI, Sew Kind of Wonderful has a free pattern for a pumpkin tablerunner, if those kind of decorations interest you. It might seem unbelievably boring to see each of these blocks as I put them together. However, they make me so happy that I can’t help sharing. I am particularly happy with this block. I started out with a cool center, which I love. Adding the dot fabric, which I thought would be warm, fits perfectly. It takes on a warm cast, I think. I also counted up the dots I have and found 11. That is one short of those needed for the number of blocks in the pattern. 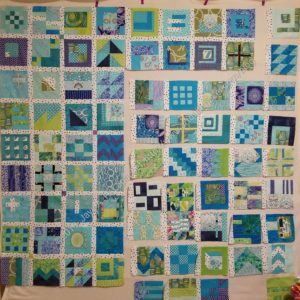 I don’t mind repeating one, but I may make more blocks, which means I will have to repeat others. Stay tuned. I should have started a new project sooner then I wouldn’t have felt so bad. I started on the next block and I really like it. 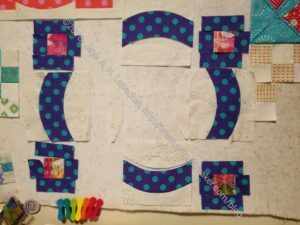 I’m still sticking to dots in the outer section of the block. I haven’t decided if I will try the stripes. The thought of matching stripes makes me a bit crazy. 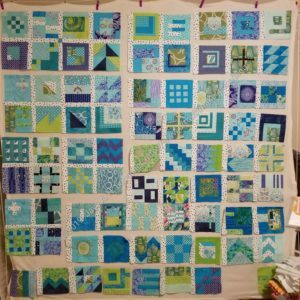 I worked on this block at the retreat, too, and made good progress. 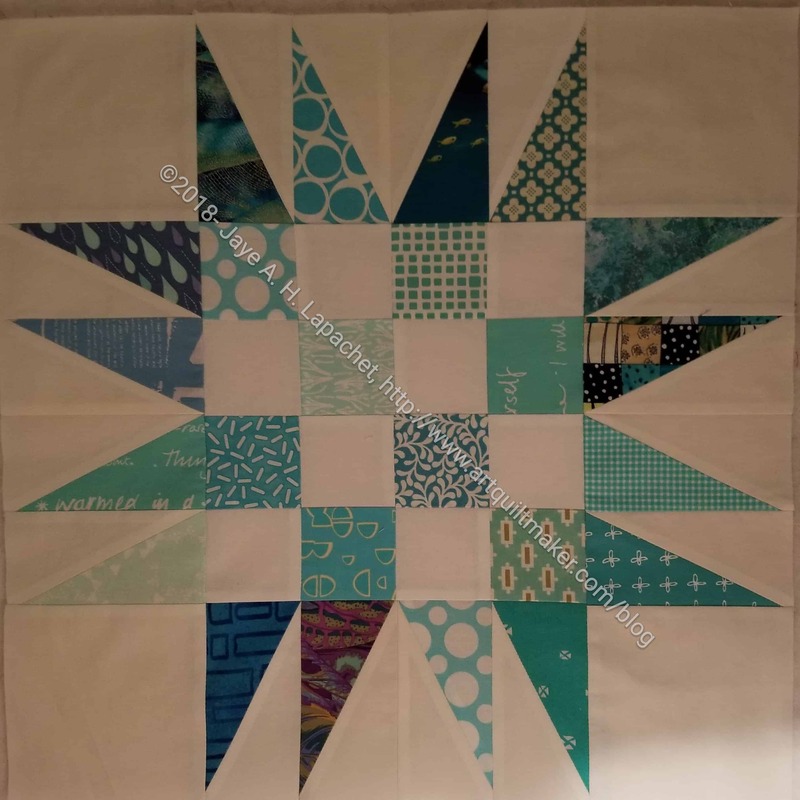 Having a nice piecing project to work on is awesome. I did finish the block yesterday and am pleased with the way it came out.